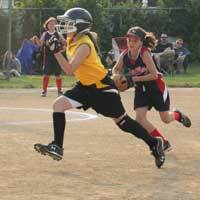 NYAA Softball serves the Northwestern Lehigh School District area to provide both recreational and competitive softball opportunities for girls ages 6 - 15. It is the intent of this organization to encourage and actively promote good sportsmanship, leadership, discipline and respect among the team members, parents, coaches and provide a drug-and alcohol-free environment for our youth. It is the goal of NYAA Softball to see that every child, in every league, should participate in every game and play at least 25% of each sport season available. Fall softball offers 4 levels of player participation. Softball players in this level played anywhere from 1-4 years. The primary focus continues to be on enhancing skills while introducing competition and teamwork. The head coach, based on ability and performance of players during practice sessions and practice attendance, will assign field positions. The primary focus is to continue to develop and refine softball skills for players interested in playing higher-level competitive softball. This level is for the most skilled and committed players. Sponsorships: Local businesses are encouraged to contact for more information about sponsorship opportunities. NYAA Softball Recommended: See our list of recommended instructors, camps and where to purchase equipment. View list or download (PDF).